Elijah Managoi, the new 1500m IAAF World champion remains focused on lowering Hicham El Guerrouj’s 19-year old 3:26.00 world record. He targets to run a sub 3:25 in the race probably by next season. 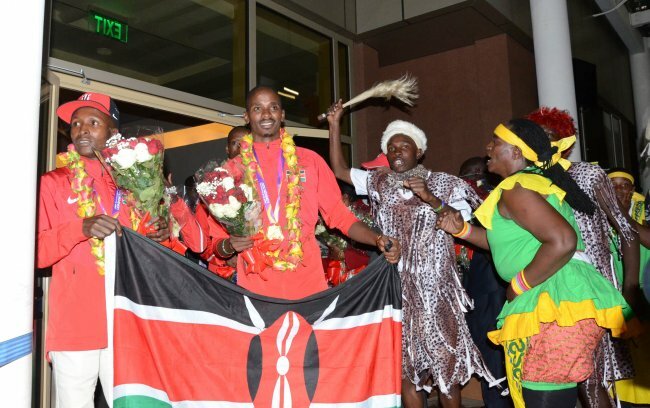 Manangoi was one of the gold medalists who returned from London and were treated to a warm reception at the Jomo Kenyatta International Airport in the wee hours of Tuesday morning. Besides Manang’oi (1500m), Geoffrey Kirui (Marathon) also returned while some athletes remained in London ahead of the Birmingham leg of the IAAF Diamond League. Manang’oi was all smiles as he affectionately caressed his gold medal, one he had hugely worked hard for after finishing second in Beijing and more recently, failing to compete in the Olympics due to injury. “I lack words to explain how I feel. I really worked hard for this and now I have gotten it, it gives me so much joy. My family and everyone who supported me, I say thanks,” a joyous Manangoi said. It has been a great season for his family as just less than a month ago, his younger brother George was crowned World Youth champion during the IAAF World Under-18 Championships in Nairobi. Manangoi has hinted they are planning a big party to celebrate the feat back at his rural home in Narok county. Julius Yego, the 2015 javelin champion says he is disappointed after failing to perform well in his title defense. Yego managed a best throw of 76m and bowed out abecause of a recurring groin injury he picked last year in Rio. However, he says finishing last did not break his heart but has only given him a resolve to work harder after he recovers from injury. “This year I haven’t performed well but I always take it positively. I have been having problem after problem this season but despite everything I managed to qualify for the final which was a good thing. I was unlucky with my groin but its sports. I have a positive mind and I will come back stronger,” the 28-year old said. Yego now says he will take enough time to rest and recover to ensure the injury heals completely with his eyes on next year’s Commonwealth Games in Gold Coast, Australia. Another athlete equally disappointed with the London show was Olympic bronze medalist Margaret Nyairera. The 21-year old failed to win a medal in the 800m and has blamed this on poor preparations. “I didn’t have enough time to prepare because I was also heading to the Prisons College training and so my training routine was hugely affected. I am disappointed, but I know I will be back as a better person after this,” Nyairera offered. Kenya to bid for 2023? Hassan Wario, the Sports Cabinet Secretary announced Kenya could bid to host the 2023 edition of the IAAF World Championships. Having successfully hosted the World Under-18 Championships last month, Wario feels that Kenya is ready to be the first African country to host the global senior showpiece. “We have showed that we can host smaller events and now, we want to show that we can host the big ones. We were the first African country to top the world in the World Championship in Beijing in 2015 and now we can also be the first African country to host the World Championship,” the minister said. He was speaking on Tuesday morning as he hosted the Kenyan team from the London World Championships for breakfast at a Nairobi hotel after their arrival from London. While in Kenya for the World Under-18, Seb Coe, the IAAF president challenged Kenya to bid for the World Under-20 Championships but now, the country has chosen to chew the bigger bone. The minister noted that the government will work to ensure construction of more stadia. However, this is a promise made way too many times with the five promised in 2013 yet to be constructed. Wario congratulated the team for their performance in London despite coming second. He said the performance was commendable especially looking at the competition. Kenya finished the competition with 11 medals; 5 gold, 2 silver and 4 bronze.